AK-47 type rifle? How dare they insult the AK-47 type rifles that way! Seriously though, I'm not sure how any assault rifle = AK-47 but I guess using the term Assault Rifle is too hard for them. Reporters almost universally support Obama, and therefore are idiots, so what do you expect? Camper;9911 Wrote: Reporters almost universally support Obama, and therefore are idiots, so what do you expect? 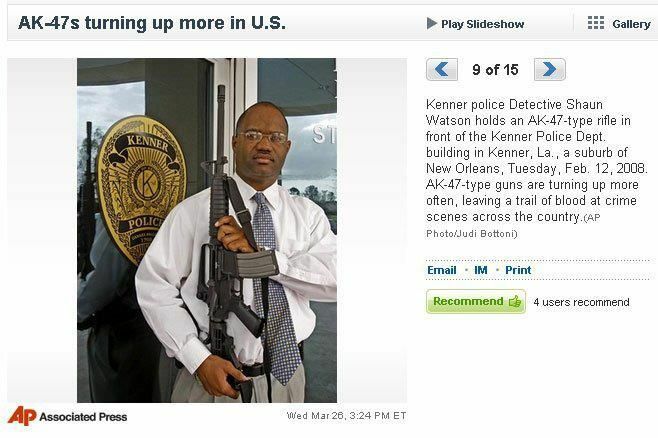 So clearly once all the EBR's are collected and destroyed the police will no longer need theirs....right? How much you wanna bet that rifle is actually one of the department rifles, and they used it because they don't actually have one of those AK-47's taken from a crime, because you know, those AK-47's are everywhere. I thought those evil black rifles were illegally modifier AK-47's?? ?